Our "Messy Church" which has been running successfully since 2010, should appeal to all and is particularly suitable for families with younger children. For both young and "young at heart", the All-Sorts drama group meet fortnightly on Monday evenings during term time providing an ideal, friendly environment for those with little or no experience to test their skills at "treading the boards". If you are interested, please e-mail for further details. 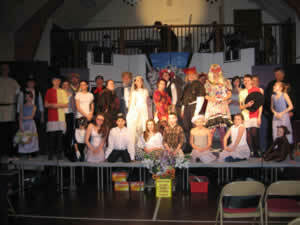 Under the auspices of the Broken Shoestring Theatre Company, highly successful biannual Pantomimes and a range of other productions have been staged at the church over many years. These events also involve many other members of the congregation. Whilst there is no Boys Brigade Company meeting at St Mark's at present, there is an active Company at St Andrew's Church, Slough. Follow this link for further details.